What? Where? 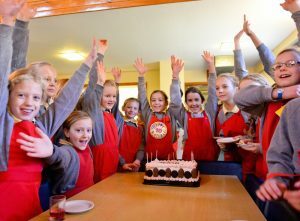 Founded in 1950, Knighton House School is a girls’ day and boarding school for ages 3-13, with boys in the ‘Littly’ Pre-Prep to age 7. Sitting pretty on the outskirts of Durweston on the Wiltshire/Dorset border and with enough acreage to run around and climb trees in, it is surrounded by glorious countryside and is only a stone’s throw from the mighty beast that is Bryanston and everything that major public school has to offer. 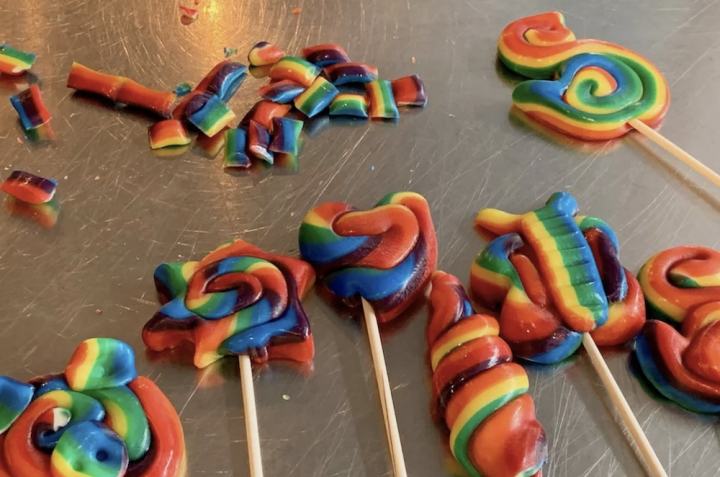 There are 80 girls in the Prep School with another 30 girls and boys in the nursery and Pre-Prep, and pupils can join at any time if space permits. Blandford Forum is the closest town but you’ll need to look further afield for a bustling metropolis – Salisbury is 45 minutes and Southampton the better part of an hour. Academic results: The ethos at Knighton House is to raise aspirational, confident and ambitious girls, and their academic record supports this. 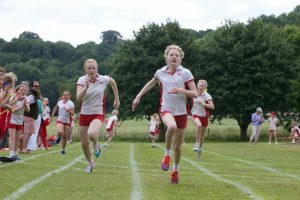 While the school is absolutely non-selective they still manage to gather themselves an impressive number of scholarships including Art, Sport, Music and All-Rounder as well as Academic. 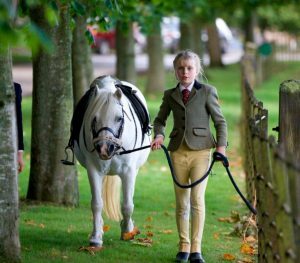 Class sizes are small – no more than 15 at any time – and the happy but relaxed atmosphere (with dogs and ponies at every corner) ensures that pupils’ potential can be truly unlocked. Most girls go on to boarding schools including St Mary’s Calne, Sherborne and Canford, though often not straying far from this bucolic corner of the world and heading to Bryanston. For littlies, the Pre-Prep is a delightful spot to start the early school years, with an apple orchard, pet shed with rabbits and oh-so-cute guinea pigs, pond dipping and a kitchen garden right on their doorstep. 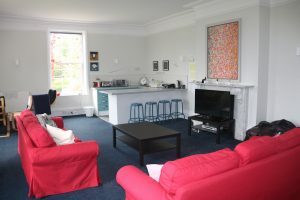 Facilities: Buildings range from the impressive main house to the Old Stables (where the DT kitchen and science labs live) to a few newer add-ons. The JB Hall plays host to school assemblies, plays and concerts while doubling as a sports hall, and the Art block is small yet perfectly formed and although won’t rival some schools’ offerings it has bright high ceilings and is stuffed with life (and art). The bin-bag dresses made by the girls on display were particularly inventive. There is an astro pitch, adventure playground, tennis courts, rounders pitch (albeit on a slope. Quite a good skill for the girls to get used to! ), cross-country routes within and outside of the grounds, music block and plenty of woods to explore. You won’t find an Olympic-sized pool or glistening new sports hall here but Knighton does have the advantage of close links with literally-next-door Bryanston and children regularly use their swimming facilities, climbing wall, theatre, music studios, dance studios…need I go on? 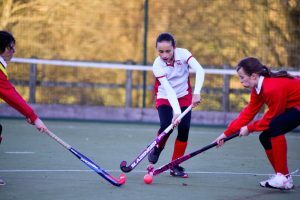 Hockey and netball are the winter and spring term sports here, and mixed teams across years make for some strong competition. In fact, sports are taken pretty seriously all round, with girls’ cricket introduced for all ages. What must be said is that horse riding at Knighton is HUGE. Eighty percent of girls ride and they can stable their ponies at school as long as other girls are allowed to ride them. It’s a great chance for horse-mad girls to keep their favourite equine friend close and for others to ride as much as they want without having to schlep out to the local stables on a Sunday morning. There is stabling for up to 15 horses and girls can have riding lessons, earn their Pony Club badges, go for early morning rides, join instructor-led clinics, learn to jump, hack across the countryside for miles and even take polo lessons (two Knighton House parents own the Dorset Polo Club). 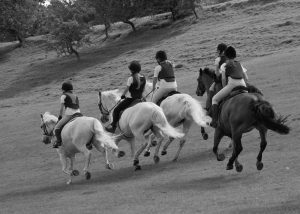 The riding team at Knighton is impressive, with regular fixtures against Sandroyd, Stonor and Millfield, and I’ve never come across a school where pupils can take part in the two local hunts that come right across their grounds! Quite frankly, it’s girly, horsey heaven. 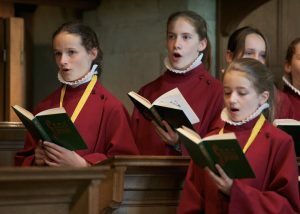 Music and drama: While almost all children at Knighton take individual instrumental lessons, singing is a particularly strong part of Knighton life, and the choir thrives. 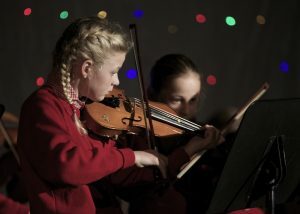 There is also an orchestra, jazz band, full array of musical groups, a musical production every year and a chapel choir that sings in church every Saturday as well as in concerts both at school and in the nearby cathedral. Pupils take regular LAMDA exams, with almost all of them gaining Distinction. Boarding: Knighton House offers the full array of flexi, weekly and full boarding that we have come to expect, but they make it so much fun that, unsurprisingly, by Year 8 almost all girls board. 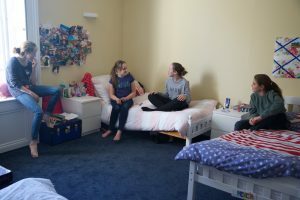 The youngest boarders are only 7 years old and even flexi boarders staying only one night a week have their own bed, an unusual treat and a lovely touch for girls to bring in their own bedding, clothes and posters. Extra nights can be added on an ad-hoc basis and weekends are popular, with each weekend given a different theme. Out-of-school activities include ice skating or water-park visits plus trips to the beach at Durdle Door or fossil hunting in Lyme Regis, but the school also makes the most of the facilities on offer right here, with camping in the field or water slides laid out over their hill. 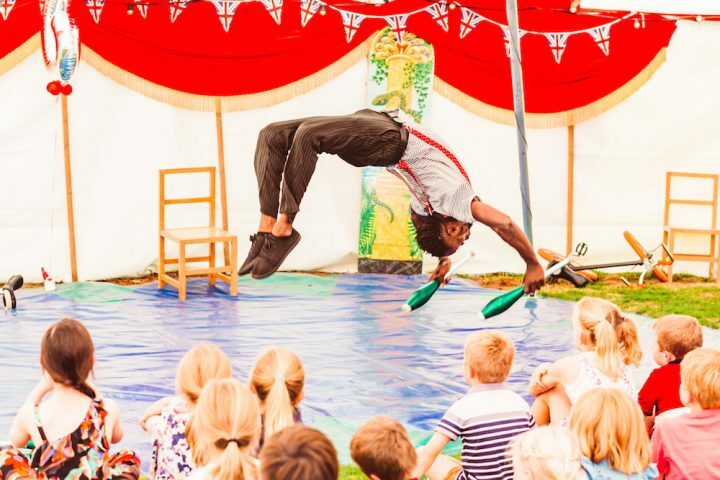 The spectacular Miss D is Head of Boarding and clearly makes weekends magical as most weekends are fully booked with up to 35 children boarding – in fact I am told that as soon as the list of themed weekends come out parents start nabbing their spots. When I was there Miss D was preparing for Knighton Fairies Weekend and had spent most of half term creating the most gorgeous fairy houses and costumes for the entire of Year 4. The dorms are situated in large rooms in the main house and, with no smelly feet-ed adolescent boys to contend with, are bright and pretty. Sitting rooms, kitchens and bathrooms all feel homely too. 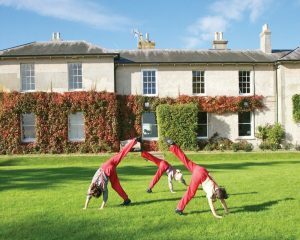 Although small, Knighton House is a ‘proper’ boarding school, with enough boarders at weekends to make a full programme of fun possible. Full boarders come from across the country, with a smattering of girls from as far afield as Spain, France, Italy and even China, although plenty of local girls board too. Headteacher: Robin Gainher took up the headship of Knighton in September and has already made quite an impression. He has clearly grasped what the school is about and is ambitious for the girls, both academically and personally. He certainly impressed me, with his warm enthusiasm and passion for the school – a hugely welcoming man with a glint in his eye. 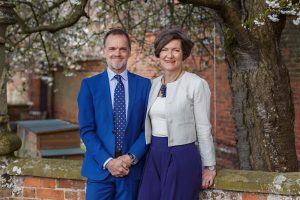 Previously head of Beeston Hall in Norfolk and before that deputy head at Cranleigh Prep, he has returned with his wife Ali to their roots in the West Country and they seem to love every minute! He is punchy and forward thinking when it comes to education, always thinking about where the school and pupils should be going, yet maintaining the family feel of the school. Pupils are not drilled until late every night and churned out without thought to the obvious big hitters in the Senior School world; instead girls leave with humility and a knowledge of the real world and also, in the headmaster’s words, with the feeling that they can conquer the world. What else? The Alpha Form (Year 8 girls) seems like the place to be. 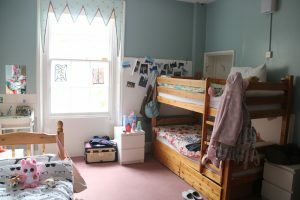 Girls have their own wing in the boarding house where absolutely no one else is allowed, with their own funky sitting room and kitchen. While at the top of the school they show their responsibility sitting with the younger girls at lunch as well as running various committees. With an exciting Leaver’s Programme of residential trips, bobsleighing and even having a go at the skeleton, it’s not surprising that the girls are desperate to get to year 8! The Personal Enrichment Programme (PEP) at Knighton deserves a special mention. 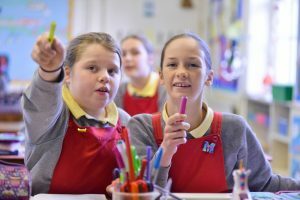 Working across the three areas of arts and crafts, academic/cerebral and sport and horse riding, it encompasses all areas of school life to help extend the knowledge and confidence of pupils. 45 minute sessions every evening include everything from current affairs to chess, Ancient Greek, shooting practise and Tea Bag Club, while Knighton’s own KED Talks (get it?) on topics such as Getting It Wrong, Resilience, Curiosity, Inventing and Asking Questions support the PEP programme. Quirks: Well, it’s the red dungarees, isn’t it? Quite possibly the quirkiest school uniform ever, these strides are not only practical (cartwheeling, climbing trees) but have become a firm tradition of Knighton, and although Year 8s are excluded from the humiliation (sorry, joy) of wearing them, you can be sure that on their final day they pull out their famous dungarees and get classmates to sign them. I am told that girls keep them lovingly in their bottom drawers and there has been some serious competition to see who fits into them in later years when returning for school reunions. I loved seeing the dogs here and there – under teachers’ desks, pootling up and down the corridor, smoking behind the bike sheds… (OK, maybe not that.) Another lovely touch is the schools’ Gumption Cup for the girl who has shown the most gumption to get on with it and make it work. For me, it summed up what Knighton is about – a happy, country, outdoorsy school with confident, go-getting kids. One parent mentioned to me that some people outside of the Knighton fold think of the school as cutesy and fluffy. It is not. I found it high-achieving and ambitious in the best possible way, with strong pastoral care and classes small enough for the girls to thrive. Fees: Prep School – Day Pupil Year 3 £4,454 per term, Years 4–8 £5,764 per term, Boarding £7,600 per term, Flexi-Boarding 1 night £380, 2 nights £760, 3 nights £1,140. The Orchard Pre-Prep – Years 1 and 2 £2,915 per term, Reception £2,454 per term, Nursery £2,325 per term (maximum cost for full time attendance). Now, hang onto your hats ‘cos this one’s a biggie: a new fee structure will start in Sep 2018 which will take the fees back to their 2010 levels, and fix them there for 2 years. This is not a gimmick – the headmaster assures me that this is a long term project and fees won’t be shooting back up any time soon. The move has been driven by the man himself, who can see how high some Prep fees are getting and believes Knighton can offer a tremendous education without the sky-high ticket. So, fees for 2018-19 and 2019-2020 will be: Day Pupil Years 3 & 4 £3,750 per term, Year 5 £4,500 per term, Year 6 £4,750 per term and Years 7 & 8 £4,950 per term. The Orchard Pre-Prep will start at £2700 per term for Reception children. Word on the ground: Parents love the school for its small, nurturing feel, and of course the ponies! One parent pointed out that the family feel of the school extends so far that the overseas boarders are always offered sleepovers at local girls’ houses during exeats, rather than going to their guardians. Another parent chose Knighton House the very moment her daughters ran off to explore when they came to an open day – and what better sign could you get than that? 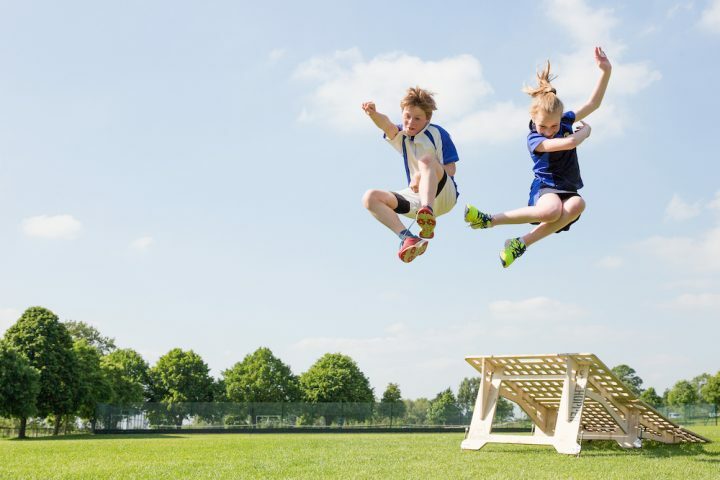 Good for: Parents looking for an all-round, forward-thinking school, who believe that extra-curricular activities and what happens outside the classroom are just as important as what happens in the classroom. Locals as well as Londoners looking for a rural idyll where kids can be kids. Not for: Those after a whopper of a prep school with every facility under the sun. They do take their sport seriously here but I suspect overly ambitious athletes and future Olympians (except equestrians) might not get the push they need. Dare to disagree? The next Open Day is on 7 March, but the school is always happy to show prospective parents around. You can get in touch here.